One specific area is already being groomed as a centralized downtown-type main street for Parrish—a section from U.S. 301 to Route 62 that includes the popular family tourist attraction Florida Railroad Museum. This part of town is envisioned as a hub for local and regional businesses inclined on the market potential of several established communities nearby. Of these Parrish homes for sale, there are many established neighborhoods such as Lexington, Forest Creek, and Copperstone. There are newer ones too like the Silverleaf development of Neal Communities and Harrison Ranch of Pulte Homes. A unit of the Parrish Civic Association, the Rural Development Committee (RDC), is spearheading recent initiatives to create a more business-friendly environment in Parrish. The RDC, which was organized in 2015, has engaged the consultancy services of a former Manatee County zoning official to lobby and work with the county on a purposive pro-business direction for Parrish. This private land-use consultant, Bob Schmitt, has identified multiple business barriers in Parrish which need to be addressed. One of the biggest obstacles is the town’s requirement for a public hearing for the establishment of a local commercial building with over 5,000 square feet floor space. To ease this rule, Schmitt is suggesting to increase to 20,000 square feet the public hearing requirement for any planned commercial building. Other issues that could help Parrish become business-friendly include revisions of its landscaping buffer regulations, parking density rules, and signage requirements. There appears no other way but to reshape some of the policies seen as inhibiting business growth in Parrish because of its rising population. In one estimate, it was projected that the residents of this town would double from the current count of about 25,000 to 50,000 by 2030. The educational component is also helping forge changes and growth in Parrish. In August 2019, the new North River High is set to open at the southeast corner of Martha Road and Erie Road. 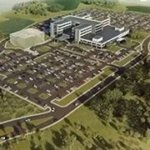 A campus of the State College of Florida is also in the pipeline on Erie Road a short distance west of the envisioned downtown of Parrish. Tailwinds of growth are likewise now being felt as a result of the construction and opening of Fort Hamer Bridge. 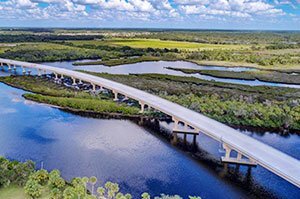 Besides linking Parrish to Lakewood Ranch and other life and leisure centers in the south, this new span also helps further stimulate interest of both residential and commercial developers on the local market. For instance, Neal Communities, which already has significant presence in Parrish, is set to develop another housing project at the site of the Palmetto Pines Golf Course. Another builder, Lee Wetherington Homes is entering the local market with its Cypress Glen neighborhood set at the golf community of River Wilderness in Parrish. 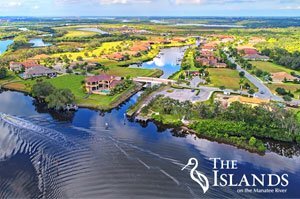 It is also planning to build custom homes in Islands on the Manatee River, another Parrish community. Commercial development, meanwhile, has been reported on the works at the southeast corner of U.S. 301 and Fort Hamer Road just north of the new span over the Manatee River. A yet- unidentified party is said to have already put this 13.3-acre parcel under contract for a grocery store, health club and a sit-down restaurant. For sure, the RDC would want this venture to eventually pan out, as it would affirm the stature of Parrish as hotspot for growth and development in north Manatee.